In 1790, President George Washington was searching for ideal candidates to be nominated to the first U S Supreme Court. Among others, he chose a 38-year-old Edentonian by the name of James Iredell, Sr. Two days later, February 12th, the Senate confirmed Iredell who became the youngest member of the original Supreme Court. The home of James Iredell, Sr., is in Edenton and operated as a North Carolina Historic Site. Iredell did not warm to the idea of revolution easily. Yet, once convinced, he became the leading advocate for American Independence and focused a great deal on the inequities of the court systems imposed by the Crown. After the 1787 convention at Philadelphia proposed a new federal Constitution, Iredell launched a public movement in North Carolina in favor of its adoption. When George Mason of Virginia published eleven objections to the document, Iredell responded in 1788 with his “Answers,” that complemented the Federalist Papers. His “Answers” were widely circulated, not only in North Carolina but in the rest of the emerging nation, as well. The Edenton Historical Commission works closely with the Iredell House Association and the state in restoration of dependencies related to James Iredell’s property. Significant accomplishments at an early age were nothing new to Iredell. He moved from England to Edenton to become a customs officer at age 17 and found time to study the law under Samuel Johnston, another famous Edentonian. Even though he worked for King George, Iredell was a leading essayist advocating independence. As a Federalist, he advocated the adoption of the proposed Constitution to his fellow North Carolinians. 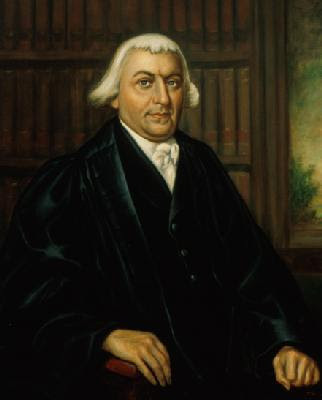 Iredell is credited with establishing many key themes and ideas of the Declaration of Independence in a treatise he wrote, Principles of an American Whig. Iredell is said to have worked closely with President George Washington and John Adams in establishing early standards of US law. For example, in the recent (1999) Supreme Court case Alden v. Maine, the majority opinion referred to Iredell’s Chisholmopinion.